Full employment, large-scale investment and rising tourist numbers – Islay’s whisky boom is a major success story. And yet islanders are increasingly conflicted about the impact it has on their daily lives. Following Scotchwhisky.com’s investigation of Islay’s infrastructure issues, here’s the view of Scott MacCallum, Islay-based journalist and former editor of local newspaper The Ileach. There has been an advert for Skittles, those little pieces of fruity confectionery, on our television screens recently. It shows a guy for whom everything turns into Skittles when he touches it. As we know, there is no such thing as a new idea – King Midas was doing something similar centuries ago – but, no doubt, an advertising agency will have been well-rewarded for its innovative idea. The moral is that you should be careful what you wish for. It’s something which is particularly pertinent when discussing Islay and its relationship with the whisky industry. Is there too much whisky on Islay or, to be a little clearer, is the increased and increasing production of whisky on Islay becoming detrimental to the island as a whole? Surely the production of such a valuable commodity can’t be a bad thing? But talk to the locals and you will find that the island is conflicted. 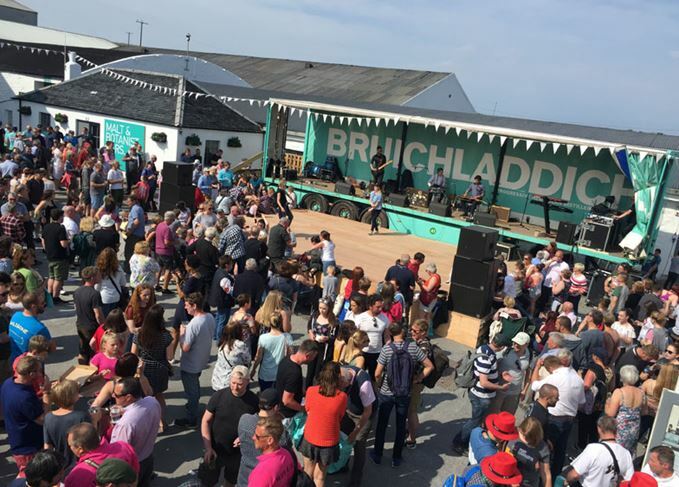 The tourist dollar, yen, euro and pound are extremely welcome, but the increase in visitor numbers, particularly during the Islay Festival, when the population of the island soars from 3,200 locals to over five figures, makes things a little cramped and uncomfortable. It’s a week when those who love queues as much as their drams are in their element. With every hotel and B&B room booked a year in advance, many visitors resort to camper vans, usually rented, and often with a steering wheel on the ‘wrong’ side. There are any number of near-misses on the narrow roads. Ah, those roads. Built on peat and more than capable of dealing with the odd Morris Minor, but now facing a regular pummeling from huge articulated tankers making daily visits to the distilleries. One statistic which has yet to be fully rebuked states that one tanker causes more damage to an Islay road than 150,000 cars. And those distilleries. Nine of them, if we count Ardnahoe – also including Ardbeg, Caol Ila, Bruichladdich, Bowmore, Bunnahabhain, Kilchoman, Lagavulin and Laphroaig. Then there is Port Ellen, which is shaking off its mothballs and expected to reopen in 2020 – although that probably means more like 2022 in Islay time. There are others at the planning stage, with hopes of going into production in the early 2020s. Among them is one between the village of Port Ellen and Laphroaig, at Farkin, a project of Sukhinder Singh, co-founder of Elixir Distillers. Conservative estimates see Islay whisky production increasing by one-third over the next five years. And that’s not taking into account those distilleries still at planning stage or, indeed, that great new phenomenon – gin. Production of The Botanist at Bruichladdich is forecast to increase by 290% over the next eight years, and even now the distillery makes more gin than whisky. One Bruichladdich footnote. As a distillery it employs many more people than any other on the island. The reason? It carries out everything in-house, from marketing to bottling. Bruichladdich currently has a staff of more than 100, which puts a great deal of food on a great many Islay tables. The other distilleries tend to run with a production and warehouse workforce in the mid-teens, boosted by visitor centre staff. The production increase will certainly put added pressure on Islay’s infrastructure – including those roads, where potholes re-emerge almost as soon as they are filled in, accommodation, and the overstretched and often unreliable ferries and planes. Islay is rare among Scottish islands in boasting a two-boat ferry service, to cope with the large numbers drawn to the island. However, it reduces to one boat for much of the winter and whenever a boat on another route breaks down or is due for its regular refit. It can often be impossible for an islander to book a ferry to or from the island at the time they wish to travel. Add weather into the mix and a visit to Islay can be a bit of a lottery – not knowing when or even if you will get on or off the island, thus incurring additional accommodation costs. Meanwhile, despite the recent announcement of a new service to and from Edinburgh, flying is expensive, with the 25-minute, twice-a-day Glasgow service costing three times as much as a flight from London to Glasgow. With virtually all of the distilleries owned by large multi-national companies, often based overseas (Kilchoman and Ardnahoe being the exceptions), profits leave the island and find their way into shareholders’ pockets. There are some who look enviously at Shetland, which retains a levy per barrel of oil on the island, to the benefit of the locals. When that deal was struck in the 1960s, any thought of a similar agreement for Islay would not have crossed the minds of many, such was the low-key impact whisky was making at the time. Now such a fund would make an enormous difference. The figure of £200m per annum is freely mentioned as the amount Islay sends to the UK Treasury by way of alcohol duty – yet very little of it returns. Were there to be a 5p-a-litre levy placed on whisky, Islay would benefit to the tune of around £1m a year – not much in terms of big business, but huge when it comes to what it could do for a small island. But, and this is the counter-argument, why should distilleries on Islay have to pay more ‘tax’ than distilleries on the mainland? Don’t they give enough already? Kilchoman has contributed to the much-needed improvements to the public road which its lorries and visitors use to access the distillery. But was it really down to them? Diageo has the biggest footprint on Islay with Lagavulin, Caol Ila and Port Ellen emerging from its mothballs, as well as the Port Ellen Maltings. The company points to Islay visitor numbers which don’t bear comparison with those at its busiest distilleries, Blair Athol and Talisker. Annually they have over 80,000 visitors each, while Lagavulin and Caol Ila – which is about to see its visitor centre expanded and improved – bring in 42,000 visitors between them. The point is that the distilleries themselves are not the problem when it comes to the ‘too much of a good thing’ argument. It’s the failure of the infrastructure to keep up with the popularity of single malt whisky and the birth of whisky tourism. The island has an unemployment rate of 0.6% which, in all but name, is full employment. In other words, there are more jobs than people. Great, you might say – Utopia! But finding people to become tour guides, or to work as chambermaids or bar staff in hotels, is a huge headache. Locals already have one or more jobs, and incomers to the island help, but where are they going to live? Lack of available housing is another issue, compounded by the fact that there are many lovely houses which lie empty for much of the year. They are known as Dark Houses – holiday homes. If this sounds like a litany of complaints, please forgive me. Islay is a fabulous place and it owes much to the production of its fantastic whisky. A small dot off the west coast of Scotland, but people make pilgrimage from every alcohol-drinking nation on the planet. For many, coming to Islay is the culmination of a dream. We are very lucky to live on the island and enjoy the company of these whisky lovers. However, to maximise their enjoyment and to make our lives as liveable as possible, investment in Islay’s infrastructure has to match investment in the distilleries. The new Isle of Skye distillery documents key milestones from building work to production.